I like that quote, and what is giving me joy today is that touch of blue. Blue means clear skies and sun, a couple of things that we have missed much of this summer. Yesterday was in the 60's with rain, the day before, rain, the day before that, rain. etc etc. But....because of all that rain, the garden is flourishing, growing literally by leaps and bounds, except for a couple of tender small plants that the bunnies have decided they can't do without. ARGHH!! And it has contributed also to the abundant weed count. My exercise consists of bending and pulling, bending and pulling. I bought a morning glory vine at Ace Hardware in the Spring and she is doing marvelous. Love those heart shaped leaves and the light that illuminates from the center of the flowers has always fascinated me. 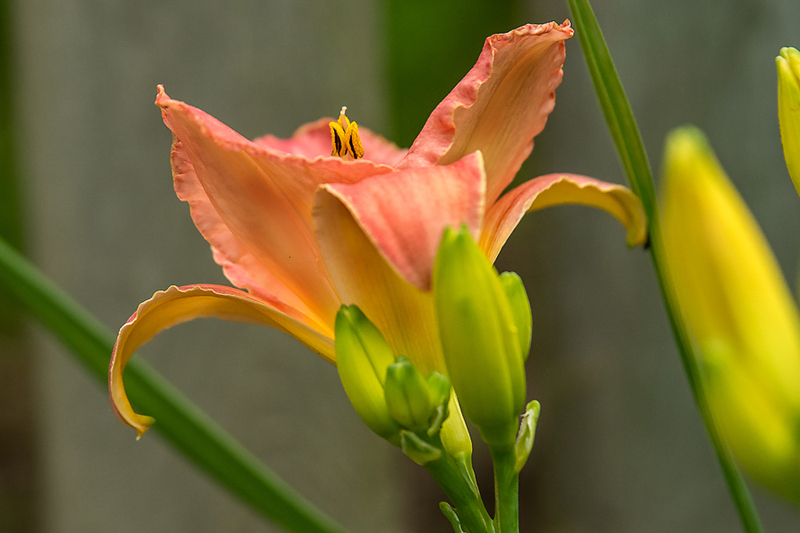 The Day Lilies are beginning to bloom. There are a myriad of colors scattered throughout the garden, always a pleasure to see each one bloom. 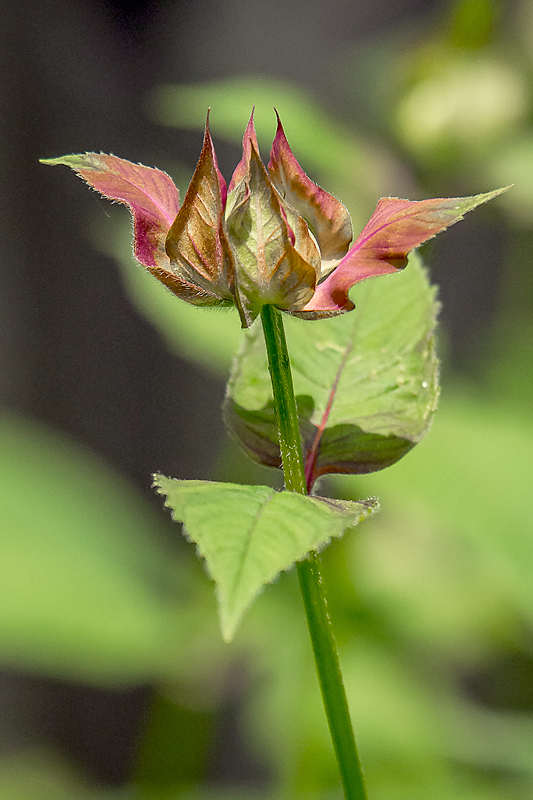 And the Monarda (Bee Balm) is about ready to burst. I love it in bloom, it attracts bees and butterflies, which is a photographer's delight!! 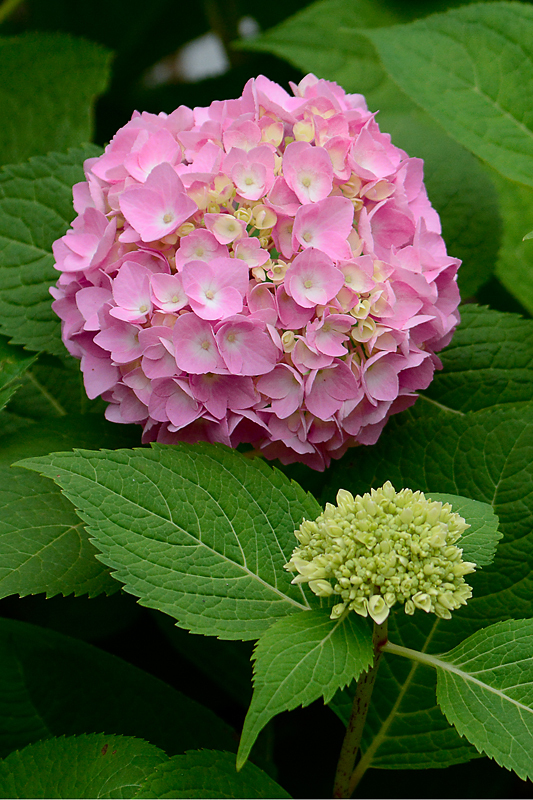 The hydrangea that never bloomed last year is blooming with more blooms coming. Oh that makes my heart sing. Honestly I am surprised by the growth considering the lack of sun, but I guess it is making up for less sun with more rain. Mother Nature continually amazes and baffles me. Here we are drenched in the Midwest and the West is so dry. A little balance is definitely in order, please. I hope you have had a great week, and a good one to come. I leave for Paris in exactly 2 weeks from today. Excited, you bet, even a little nervous over the prospect of seeing so many beautiful sites and wanting to capture the moments. Everyday is planned and scheduled except for one, and I think I will venture on a walk on my own thru some off-the-beaten paths. I have a plan, I just hope the weather cooperates since there is only that one day to venture by myself. Oh - Paris! Have a wonderful trip! 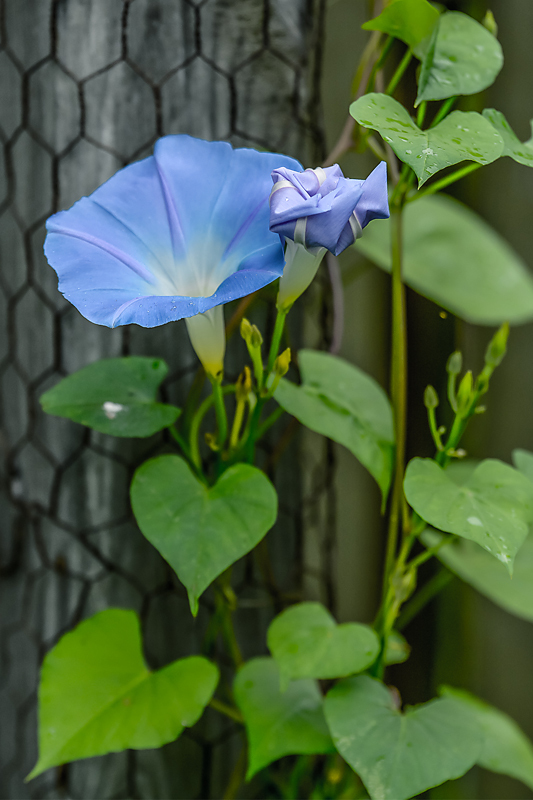 And your Morning Glories - save the seeds from the pods in the fall & replant them next spring! We MUST plan a get together upon your return. I love visiting you, Deanna and seeing how your garden grows. After a spring with daily moisture, we've been dry now for several weeks. We do need rain, and I'd like it to come daily, preferably in the evening so it doesn't interfere with my hikes! 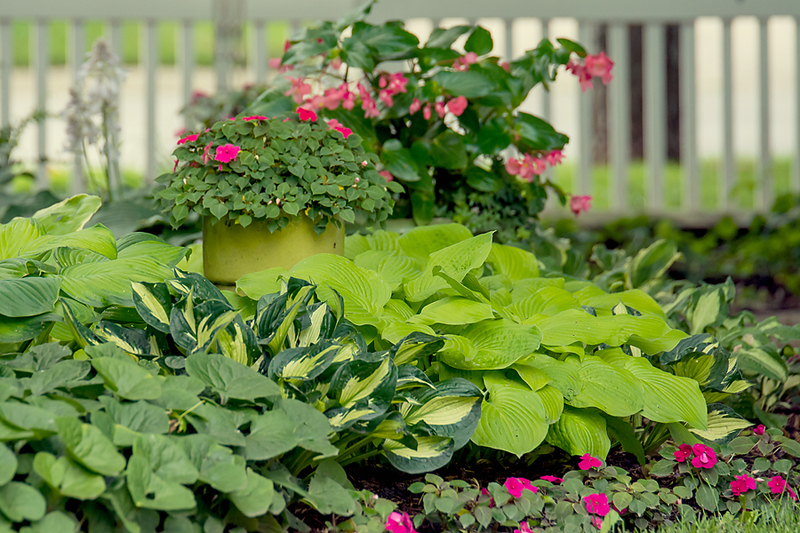 Your hosta is so beautiful. I tried to grow a couple plants here but none came back this year. Last summer, they were so slow-growing, they barely got out of the ground before frost! I love the pattern and texture and color of their leaves. You will have such fun on your trip. Can't wait to see your Paris photos! Keep weeding (so will I). Yes, rain does make for lush, beautiful flowers ... and weeds. I have a hydrangea that didn't do anything last year and is beautiful this year. I do think it was that wretched winter. Well, we leave Tuesday for Paris. It is supposed to be 100F when we arrive on Wednesday. I think I'll be spending the afternoons inside the museums. From what I can tell, things are going to be a bit cooler beginning when we leave on Sunday. Italy might be less hot than Paris. Who'd have thunk? Like you, I'm a bit overwhelmed thinking of all there is to see and all the energy it will take to see it. We're not spring chickens anymore but it's all too good to miss. So, let's just do our best and let our cameras do the rest! Au revoir! So glad you got a glimpse of blue! We were very lucky to hit MO between weather fronts. They've been getting doused too. How exciting that you're going to Paris! I can't wait to see your take on it! HI Grogeous post as usual and my favourite shot this time is the Bee Balm. You have a wonderful collection of very healthy Hostas which the slugs do not seem to have touched! Paris will be wonderful. A fantstic amount to see and take in, just kepp snapping. These willbe your memories in the future. Pitu you are not coming as far as Northern ireladn as I would have loved to meet you. Perhaps next time? Have a good week ahead. You will love Paris. I love the greenness of everything this year, and we have hardly had to sprinkle so far. I just love morning glories! Such a pleasure to view each morning. Have a wonderful time and yes I hope the weather is good for you. You have a beautiful garden. Love morning glories and perhaps one day I'll think in advance and plant some. I bet you are excited for Paris - it is on our trip scheduled for next year. I think your bountiful rain is bringing magic to your flowers/gardens . . . Happy Paris preparations . . . The morning glory looks beautiful! 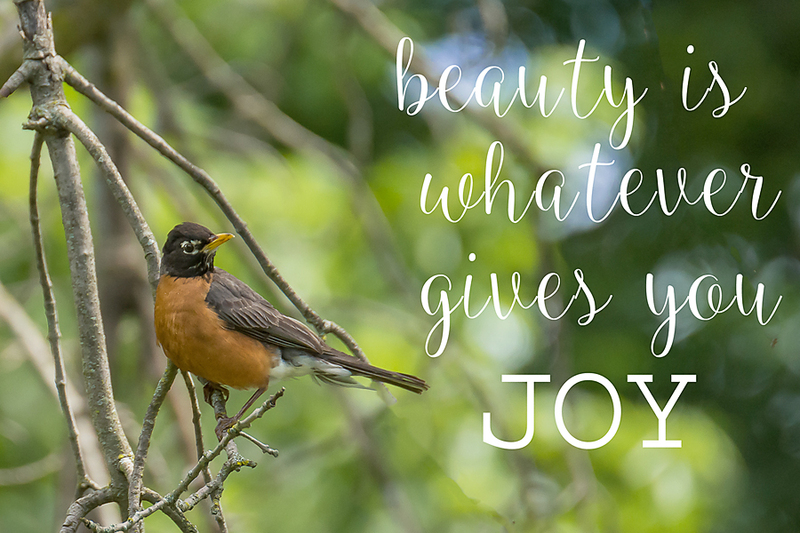 Your yard is beautiful! I wish I could bring some ferns down to you...in our yard they are almost invasive! Love those chickadee photos, I love their sweet sound, so distinctive. I'm already looking forward to your Paris photos! Gosh your temps are cool. It's been triple digits here for over a week and more to come. - I'd love a day in the 60's. - Loving all the pretty things here especially the Blue Morning Glory.